Step Out, Take the Leap! Go Further! Four Free Credits! 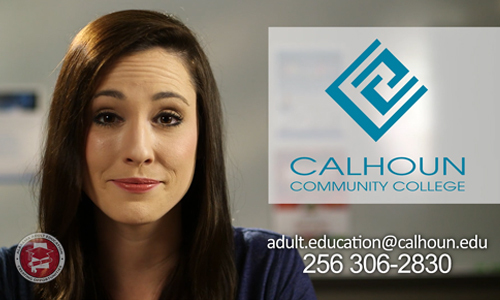 Welcome to Calhoun Community College Adult Education Services. We offer FREE adult literacy, basic academic skills, GED preparation, Employability Skills through AIDT Ready to Work, Career Pathway Programs, ASVAB and ACT tutoring and English as a Second Language instruction. Each learner works at his or her own pace and all instructional materials are available at no cost to the learner. Any adult who is at least 18 years of age and not presently enrolled in school may participate in the Adult Education programs. Students ages 16 – 17 may enter Adult Education Services with proper approval and paperwork. A picture ID and Social Security or Tax ID number is required for orientation and two forms of ID are required for GED testing services. 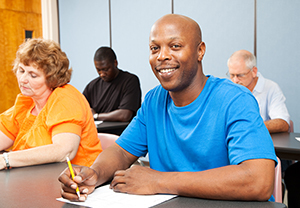 To start GED classes simply show up for an orientation nearest you or call for more information. Assessments and enrollment forms are completed during Orientation. *Students needing schedule accommodations for Tuesday should speak with the assessment test proctor on Monday. Flexible, assessable Community Class sites are offered both morning and night and are available in several locations in the Calhoun Community College service area. Students will be assigned to the class site of their choice the day of orientation. Calhoun Community College offers online learning options for individuals who are not able to take classes in a traditional classroom setting. After students complete the required orientation they are assigned to a GED instructor who will work individually with the student to help create a personalized learning plan and facilitate online instruction. Students must be at a 9th grade reading level to enter into online education services due to the rigor of the program. Step Out, Take the Leap! The GED will help further your goals. Whether you want to obtain employment, enroll in technical training or advance into college we will help you meet your goals! The Department of Postsecondary Education will provide one tuition free college course up to four credit hours for students who successfully complete the GED® test. For more information about a specific adult education program, please fill out our contact form. 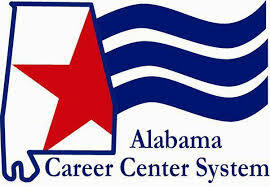 For more information on services available through the adult education program, please call 256-306-2830.